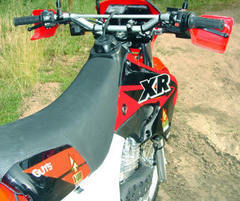 The NEW Aloop XR650L kit fits the 1993-2019 XR650L. Fuel tank capacity is approx. 2 gallons, and the new Aloop seat flows like a CR-style seat, flat and comfortable with no huge humpback like the stock seat and tank. Most importantly, the new Aloop seat and tank are over 4" narrower at the knees, and this brings an incredible sense of control and stability when you pinch the tank with your legs. Our kits come complete with fuel tank, seat (completely assembled and ready to bolt on), CR250 radiator shrouds, Shroud decals, and full mounting hardware including all bolts, petcock, fuel line etc. 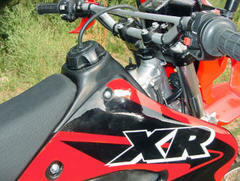 ONE IMPORTANT NOTE: We will supply the new XR650L kit with all parts needed to install it EXCEPT for an XR style fuel cap. 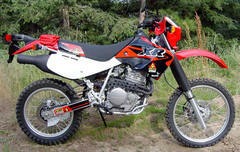 You will not be able to use your XR650L cap as it fits the metal tank. You should order a Honda cap, part# 17620-KT1-780 from your dealer. The approximate retail price for this part is just $25. Alternatively, you can order a billet XR cap from companies such as BBR or Sunline. Just be aware that you're going to need an XR cap in order to complete the installation. (Both fuel petcocks are provided by Aloop).